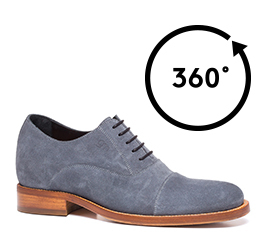 Casual and still elegant, dress shoes with a fresh touch. The new GuidoMaggi lace-up Côte d'Azur, express both the wisdom of the made in Italy craftmanship and the attention to every little detail from the great designers. The Côte d'Azur, thanks to the soft upper in suede leather, the inner lining made of luxurious goatskin, a genuine italian leather insole,outsole and heel, ensure the highest aspiration in style and the highest level in terms of self-esteem increase. Chose from several increaser heights ,including 6cm, 7 cm or 8 cm. Comfortable and soft, the Côte d'Azur is ideal for both business meetings and for long summer evenings.